Parking Jack With Foot Plate "Heavy Type"
We are among the renowned organizations that manufacture, supply and export excellent grade Parking Jacks. These jacks are suitable for various farming equipments and Trailer. It is suitable for using for fastening and disassembly with its special design. We are engaged in offering wide range of Agricultural Jacks to our most valued clients. These Agricultural Jacks are made by using modern technology and high quality material which ensure its durability. These Agricultural Jacks are highly appreciated by our clients which are situated all round the nation. We are looking for foreign queries majorly from US and Europe. Backed by profound experience of our experts, we are an unparalleled name engaged in providing a high-quality assortment of Hydraulic Bottle Jack. 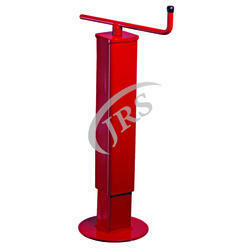 We are manufacturer and supplier of three wheeler jack. We provide an excellent quality range of jack, our clients can avail from us. These jacks are manufactured using quality raw materials and are strictly checked with by our experts for its proper. it is hydraulically operated with air pressure, used to lift the vehicles to a height of 1500 mm from the ground level for water servicing and greasing of under chassis & complete body washing. Models available are 4 tons (single post), 8 tons (single and twin post) and 16 tons (twin post). This Trolley Jack widely demanded in different automobile industries. Our product range is known for its high lead bearing capacity, high tensile strength and high performance.